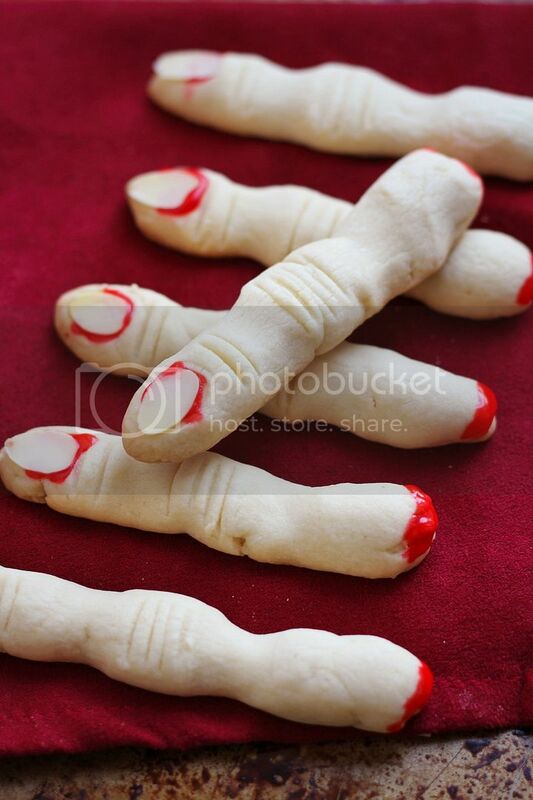 Severed Fingers Cookies & Happy Halloween! 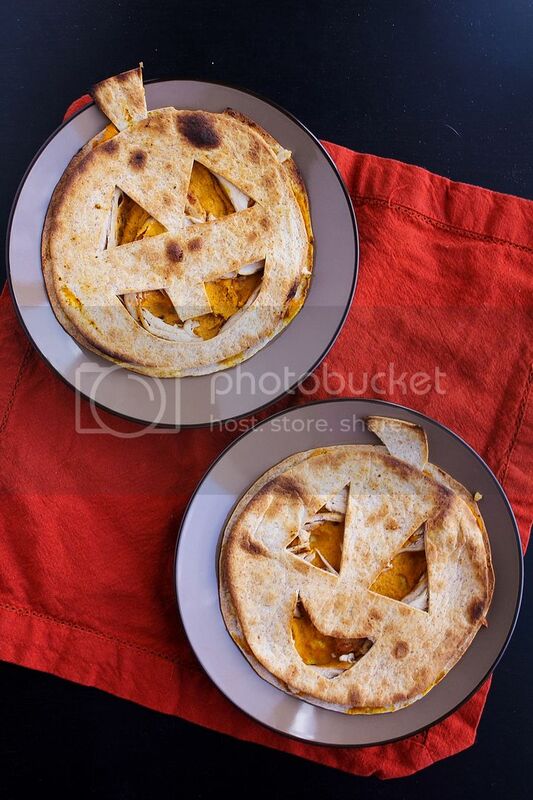 Halloween is one of the best holidays for getting creative with your food. I think there's a tricky line between food that's creepy and food that's just too gross to eat (I don't think I could ever bring myself to eat a kitty litter cake, for example, though I'm sure it would be fun to watch people's reactions to it!) 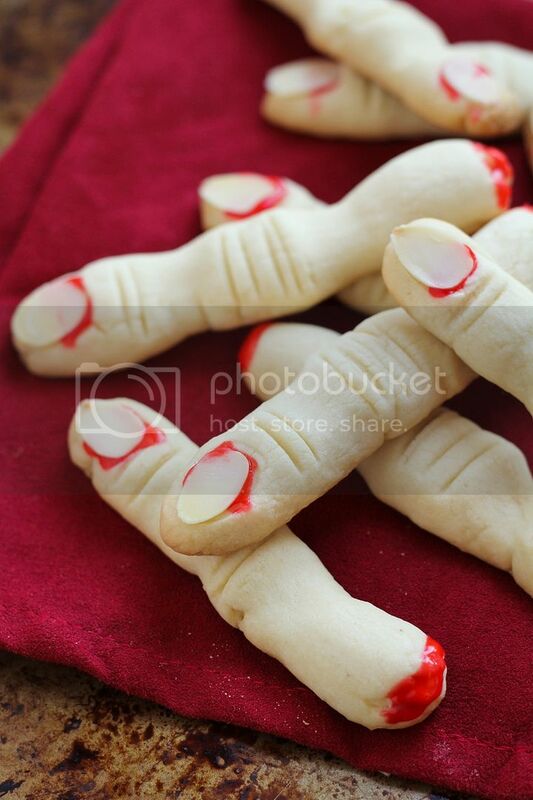 but I think these severed fingers have just the right amount of scare factor without pushing the limits too much, at least for an adult party! 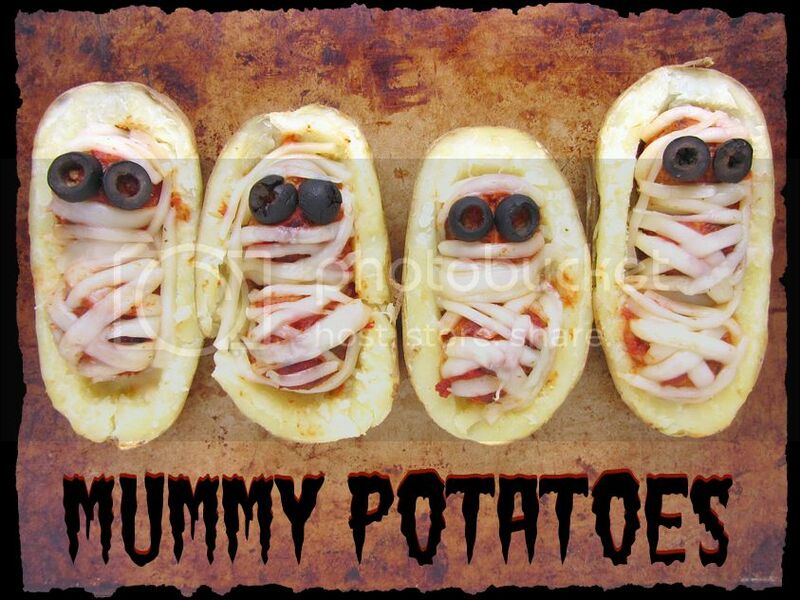 I brought these to a Halloween potluck with my lab on Wednesday and received a few comments on how realistic and creepy they looked, which was my goal, but people were still eating them which was also important! 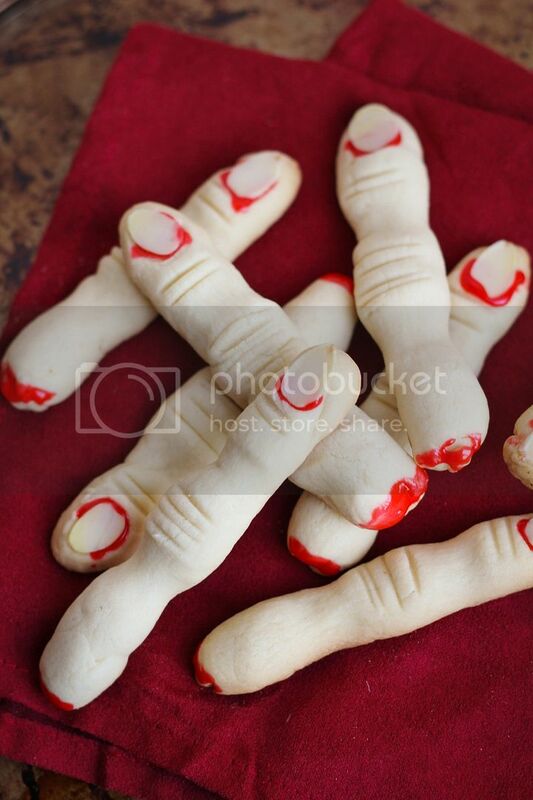 You've probably seen some version of severed fingers or witches fingers cookies on the web before but I had to share mine too because I think they're so great for a Halloween party if you still need any ideas for this weekend! These cookies are easy to make - the recipe is sort of a cross between a sugar cookie and shortbread cookie. It's a bit time consuming to shape and decorate each cookie but I had a lot of fun with it. I wouldn't say the taste is anything extraordinary as the recipe is pretty basic, but in this case I wasn't as concerned about the taste compared to the look! I'll post a link to the recipe I used below along with some tips I've learned from making these a couple of times. If you're looking for a Halloween party treat that will get your guests talking, these cookies are perfect! I actually don't have very exciting plans for Halloween other than staying home to watch a scary movie and try to fight off a cold, but I hope you all have a safe and happy Halloween! The recipe I used for these cookies can be found at Cook and Be Merry. It's similar to a Taste of Home recipe which I've seen several people make, but uses a little more sugar and a little less salt, which I think improves the taste. I did not use green food colouring. If you want these to look more like witches fingers, then feel free to colour them green! I used sliced almonds for the fingernails rather than whole blanched almonds, which was only because I couldn't find the whole blanched almonds. Either work, but I think the nails look a little more realistic with whole almonds rather than slices. You can blanch your own almonds as the recipe gives instructions for. To shape the cookies, I divided the dough in four. Keep the sections you're not working with in the fridge. I shaped each of the four sections of dough into 10 fingers. Just break it into ten even pieces, roll each piece into a cylinder, then shape the knuckles, press the almond in for the nail, and use a knife to add wrinkles at the knuckle and below the fingernail. The wrinkles are important to make these more realistic! It's really important to keep the dough chilled to prevent it from spreading. If you don't do this your fingers will spread too much and won't look realistic. I kept the dough refrigerated, and after I shaped each section into fingers, I stuck the fingers into the freezer for a few minutes to chill them back up before going in the oven. As your first set of fingers bakes, you can shape the next set then stick them back in the fridge/freezer so they're ready to go in the oven as soon as the other ones are done. Watch the baking time! My first batch I cooked for 22 minutes because other recipes had said to bake for 20-25 mins, and they ended up overbaked (dry). After that I reduced to 20 then 17 minutes for subsequent batches, but they still ended up a bit dry. Next time I would start with Cook and Be Merry's recommendation of only 15 minutes. After baking the fingers, take each almond off one at a time, squeeze some red gel underneath, then place the almond back on so the red gel oozes out from behind the fingernail (and helps the almond stick). Add some red gel to the bottom of each finger too to make it look severed. I love making cute Halloween themed treats, and dinner ideas are even better since there are already so many sweets around this time of year. 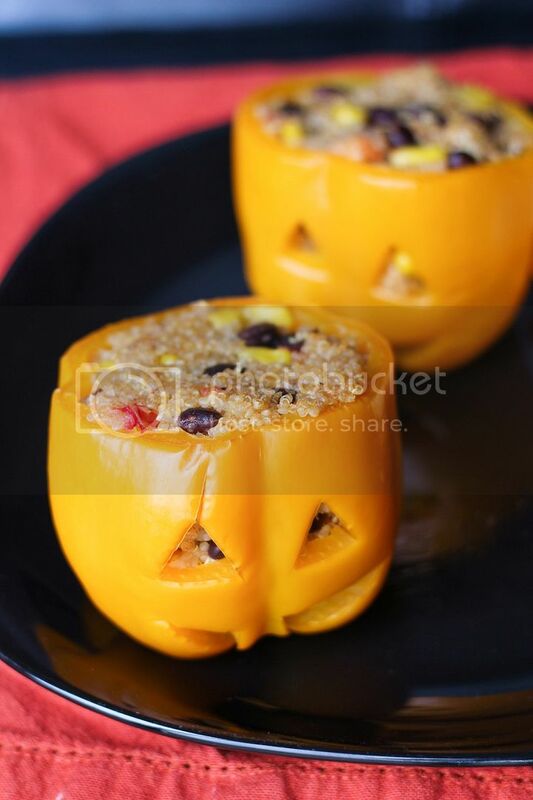 I've seen the idea of carving stuffed peppers like jack o' lanterns on several blogs before and wanted to try it for myself this year. Even though I'm certainly not the first to try these, they turned out so cute and tasty that I had to share them with you guys! These are also really easy to make and completely customizable! 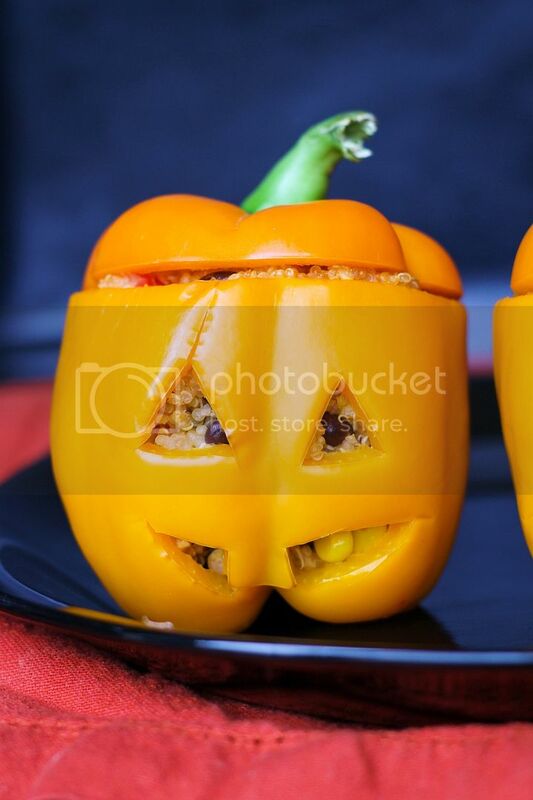 Just find some orange peppers, cut the tops off and scrape out any seeds or ribs inside, then carve your jack o lantern face with a small knife. You don't want to cut out too big of holes so that the filling could escape, but even though these are a lot smaller to work with than pumpkins, I found them much easier to "carve"! After prepping your little pumpkin lookalikes, you make your filling, stuff the insides of the peppers, and bake them to soften the peppers. 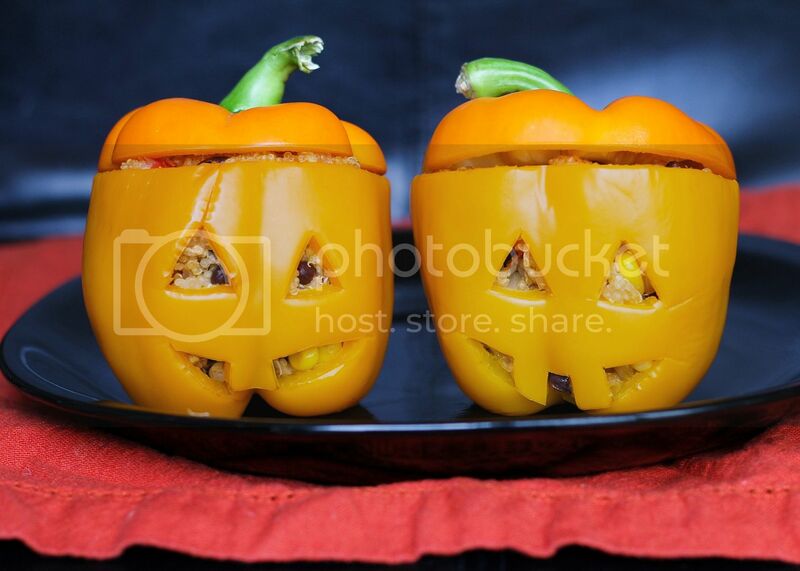 I also like to parboil the peppers first to reduce the amount of time needed to soften the peppers in the oven later, which will also help save time if you're trying to make these on Halloween evening before trick or treating starts! I filled mine with one of my favourite southwestern-flavoured quinoa mixtures, which is vegetarian and pretty healthy too. 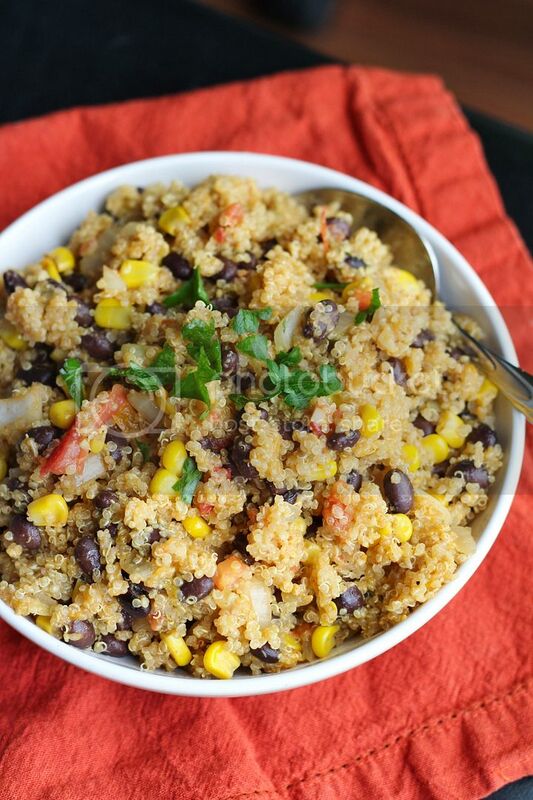 I cook the quinoa in vegetable broth which is important for giving it more flavour, then mix in some sauteed onion and garlic, tomatoes, black beans, corn, spices, and cheese. You could add in more vegetables like spinach or mushrooms if you like, or leave out the spices if your kids won't like them. I'm going to a Halloween potluck tomorrow and plan on making some scary cookies so if those turn out well I'll have another treat to share later this week! Happy week of Halloween! Bring 2 cups of vegetable broth to a boil in a medium saucepan. Add quinoa, cover, reduce heat to simmer and let simmer for 15 minutes. Remove from heat and let sit, covered, for 5 minutes. Remove lid and fluff with a fork. Meanwhile, cut the tops off the bell peppers and use a knife to scrape out the remaining seeds and ribs of the pepper, leaving the pepper in tact (as seen in pictures). Leave the tops aside if you wish to include them for presentation later. Bring a large pot of water to a boil, with enough water to cover the peppers. Add peppers and let simmer for about 4 minutes, until slightly softened. Carefully remove and set aside. In a medium pan, heat oil over medium-high heat. Add onion and saute for about 5 minutes, stirring often, until softened. Add garlic and saute for 30 seconds, stirring. Add tomatoes, black beans, corn, cumin, and chili powder, and season with salt and pepper. Stir and saute for a few minutes. Remove from heat, stir in quinoa and cheddar cheese and mix until incorporated. Spoon quinoa mixture into the peppers. There should be enough to fill 6 peppers or you can really fill 4 peppers quite full, and might still have some quinoa leftover. You could also just stop now and eat the quinoa on its own! Leave tops off the peppers, spray a 9x13 glass baking dish with non-stick cooking spray, and place filled peppers standing up in the dish. Cover with aluminum foil and bake in preheated oven for 25-35 minutes, until peppers are softened to your liking (I did 25 minutes as I was impatient but would have preferred 30). Remove and serve with tops on the peppers if desired. Eat by slicing everything up with a knife and fork and eating the quinoa and pepper together. With fall well underway, I’ve been craving heartier meals that incorporate seasonal ingredients like pumpkin and apples. 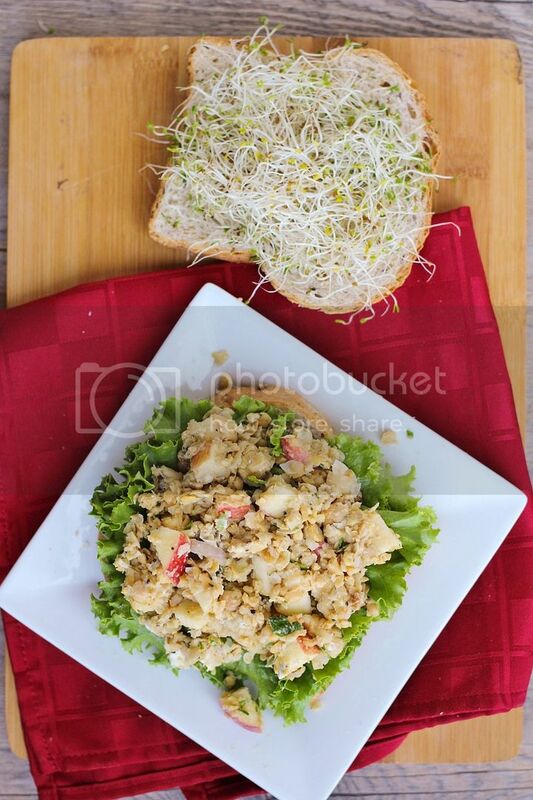 I’ve seen a lot of smashed chickpea or “chickpea salad” sandwiches around the web before and have wanted to try my own version for a while now. I knew I wanted the crunch of apples in there, and because I can’t get enough of the apples-blue cheese combination, I mixed my apples and chickpeas with blue cheese, throwing in some walnuts for more texture, and a quick mustard and apple cider vinaigrette for added flavour. Combined with thick slices of fresh 7 grain whole wheat bread, lettuce, sprouts, and a little extra mustard, this made for a really satisfying sandwich (when my dad saw my lunch one day he asked if I was Dagwood) that I loved! If I’d wanted it to be more of a chickpea salad sandwich, I could have added mayo, but I don’t ever have mayo around and I liked the flavour of the mixture on its own so I left it out. Without something like mayo to get everything to stick together, the filling is a bit messy in a sandwich, but that’s all part of the fun! You could try adding some if you prefer though, or even use a mixture of mayo and plain Greek yogurt to keep this on the lighter side. 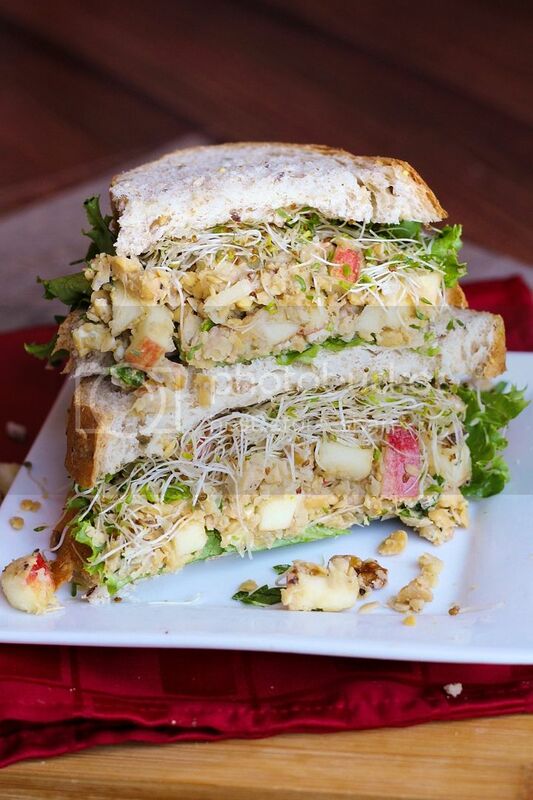 And if blue cheese isn’t your thing, here are a few other chickpea sandwiches you could try! Recipe my own but inspired by many other versions of smashed chickpeas that others have created! In a small bowl, whisk together the olive oil, vinegar, Dijon, and shallot. Let sit for at least 5 minutes (I find this takes some of the bite out of the shallots). Smash chickpeas with a potato masher or large fork; they don’t have to be completely smashed, just partially. I found it difficult to do with a fork so I pulsed mine several times in a food processor; this is quicker if you don’t mind washing an extra dish! Mix the apples, walnuts, blue cheese, and parsley into the chickpea mixture. Mix in the olive oil dressing and season mixture generously with salt and pepper. Divide chickpea mixture evenly among 4 sandwiches, along with lettuce, sprouts, and extra mustard if desired (I liked these best with added mustard!). 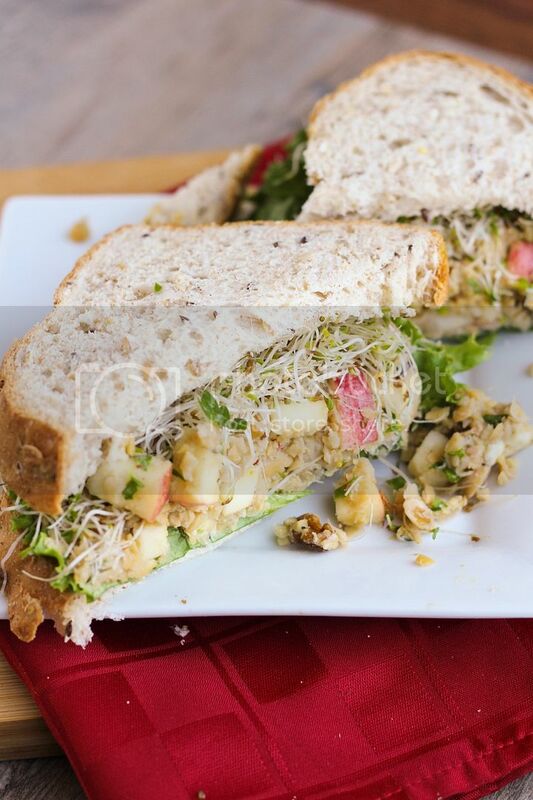 Try to flatten or “smush” the chickpea mixture onto each sandwich so it sticks together. Even still, these might be messy and I learned that it’s best to hold on to both ends of your sandwich as you’re eating to prevent the filling from falling out!